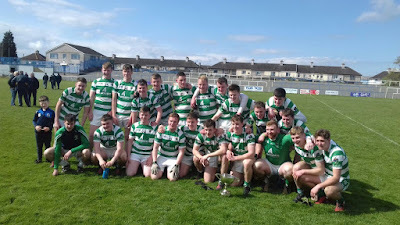 Just eleven weeks after winning the 2017 County U21 'A' Football Championship, Ballinacourty retained their title with a 3-15 to 0-11 victory over Gaultier at Walsh Park today. The lads got off to a brilliant start, opening up an eight point lead after 15 minutes. By the break the Eastern side had halved the deficit. Two great saves early in the second half proved crucial as the boys took control once again and won by an impressive thirteen points. Congratulations to all the players, management and backroom team on winning the club's twelfth title at this grade. Well done also to David Looby on his Man of the Match performance which included ten frees, many of them against a strong breeze in the first half, and one 45. Our ever popular Jack the Joker fundraiser continues this Sunday night in Alice O’Connor’s Bar where the jackpot is €9800 as on Sunday night Jean O'Donovan was drawn out of the drum and chose card number 29 which when turned was not the joker but she did win €50. Eugene Duggan and Patrick O'Brien won €25 each. As well as our group of ticket sellers tickets can be purchased from Village Flowers, Spar, Mousies Takeaway, Minnies Bar, Abbeyside Post Office and Crottys Bar. Our senior footballers played their second game of the County Championship on Saturday afternoon last when they took on Clashmore. On the day it was our opponents who emerged as deserved winners by a point. TEAM: S. ENRIGHT, C. McCARTHY, J. ELSTED, D. McGRATH, J. O'MAHONY, D. COLLINS, S. BRIGGS, C. PRUNTY, M. POWER, S. WHELAN BARRETT, P. HURNEY, D. LOOBY, N. MONTGOMERY, M. FERNCOMBE, T. LOOBY. SUBS: M. O'HALLORAN, J. HURNEY, S. O'HARE, B. LOOBY. Our intermediate football team continued with their winning start to the season as they defeated Colligan in their second game of the championship on Saturday night last. TEAM: K. DWANE, S. O’GORMAN, G. BREEN, M. TWOMEY, D. MONTGOMERY, P. COLLINS, D. HENLEY, J. BERESFORD, S. AHERN, G. HURNEY, T. MURRAY, D. HICKEY, S. CLIFFE, A. BERESFORD, R. RYAN. SUBS: E. KIELY, P. POWER, T. COLLINS, J. DUGGAN, S. O'CONNOR. This Sunday afternoon our Under 21 footballers take on Gaultier in the County Final in Walsh Park. When the sides met a few weeks ago in the 2017 County Final there was very little between the sides so all support here would be greatly appreciated. Our club bingo session continues in the CBS Hall this Sunday night with a jackpot of €2100. The league position of teams on equal points is determined by the result between the teams. Our ever popular Jack the Joker fundraiser continues this Sunday night in Alice O’Connors Bar where the jackpot is €9600 as on Sunday night Carmel Power and Jack Elsted were drawn out of the drum and chose card number 24 which when turned was not the joker but they did win €50. Jim Egan and the Walsh family won €25 each. As well as our group of ticket sellers tickets can be purchased from Village Flowers, Spar, Mousies Takeaway, Minnies Bar, Abbeyside Post Office and Crotty’s Bar. Our senior footballers got their Championship campaign off to a winning start on Sunday night last when they defeated Brickey Rangers in Fraher Field. This Saturday we play Clashmore in Cappoquin at 4pm. TEAM: S. ENRIGHT, C. McCARTHY J. ELSTED, D. McGRATH, J. O'MAHONY, D. COLLINS, S. BRIGGS, C. PRUNTY, M. POWER, S. WHELAN BARRETT, M. O'HALLORAN, D. LOOBY, N. MONTGOMERY, M. FERNCOMBE, T. LOOBY. SUBS: P. HURNEY, J. HURNEY, S. O'HARE, B. LOOBY. Our intermediate football team also got their year off to a perfect start when they defeated Ballinameela in Old Parish in the first round of the Western Championship. This Saturday they play Colligan in Abbeyside at 7:30pm. TEAM: R. RYAN, S. O’GORMAN, G. BREEN, M. TWOMEY, D. MONTGOMERY, P. COLLINS, P. LYNCH, M.POWER, J.BERESFORD, S. AHERNE, G. HURNEY, T. MURRAY, D. HICKEY, A. BERESFORD, E. KIELY. SUBS: M. FIVES, P. POWER, S. CROTTY, T.COLLINS. Our club bingo session continues in the CBS Hall this Sunday night with a jackpot of €2000. Our ever popular Jack the Joker fundraiser continues this Sunday night in Alice O’Connor’s Bar where the jackpot is €9400 as on Sunday night Michael Scanlon was drawn out of the drum and chose card number 53 which when turned was not the joker but he did win €50. Tony and Siobhan and Mary Morrissey won €25 each. As well as our group of ticket sellers tickets can be purchased from Village Flowers, Spar, Mousies Takeaway, Minnies Bar, Abbeyside Post Office and Crotty’s Bar. On Thursday night we recorded our first win in the County Championship when we defeated Ballyduff Upper in what was a well contested game played in very difficult conditions. TEAM: S. ENRIGHT, M. TWOMEY, J. ELSTED, D. McGRATH, J. O'MAHONY, D. COLLINS, C. PRUNTY, S. O'HARE, M. POWER, S. WHELAN BARRETT, P. HURNEY, S. DALY, N. MONTGOMERY, M. FERNCOMBE, T. LOOBY. SUBS: E. KIELY, J. BERESFORD, M. O'HALLORAN. Our Junior A hurlers played their first game of the Western Championship on Saturday afternoon last when they travelled to Ardmore to take on The Geraldines. At half time it was our opponents who led by a goal, but a very good performance from the team in the second half saw them emerge winners by two points. TEAM: A. BERESFORD, S. O’CONNOR, G. BREEN, S. AHERN, P. LYNCH, J. DUGGAN, S. BRIGGS, S. CLIFFE, S. CROTTY, T. MURRAY, K. DWANE, R. RYAN, E. BRACKETT, D. SWEENEY. SUBS: L. HURNEY, E. ENRIGHT, D. HENLEY. This Sunday our Senior Footballers open their Championship campaign with a game against Brickey Rangers in Fraher Field at 6pm. Our Intermediate Football team also play their first match of the year this weekend when they play Ballinameela in Bushy Park on Saturday at 5pm. On behalf of all in the club we would like to wish the County Minor Football team the very best of luck ahead of their Munster Championship match against Cork tonight in Pairc Ui Rinn. We especially wish Colin Foley who is on the team and Timmy Organ who is part if the back room team the very best of luck. Our club bingo session continues in the CBS Hall this Sunday night with a jackpot of €1950.